[polymythic] Is helping the blind see with his haptic feedback device called HALO. 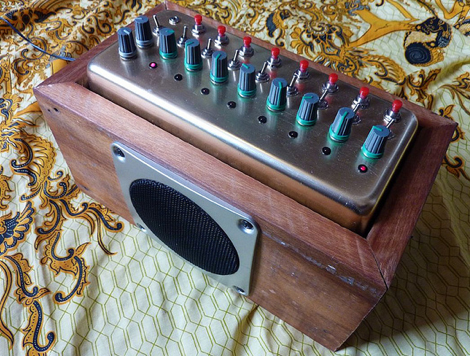 At the heart of the device is an Arduino Mega 2560 which senses objects with a few ultrasonic range finders and then relays the information back to the user using some vibration motors from old cell phones. The user can feel the distance by the frequency at which the motor pulses. The faster the motors pulse the closer an object is. This kind of sensing is something that it can be applied to pretty much any sensor allowing the user to feel something that might be otherwise invisible. While haptic feedback is nothing new its good to see continuing work with new sensors and different setups. [Bill Fienup] and [Barry Kudrowitz]’s robots, The Automatos, have been leaving a sticky path of destruction all over the internet. Their sole purpose: to crap ketchup. They accomplish this feat by dumping a CO2 cartridge into a ketchup bottle at the push of a button, leading to some pretty awesome results. While the details are a little sparse it appears that they are using RC cars for the base and a small air gun CO2 cartridge to push the ketchup. The latest version aka the Atuomato 4 appears to be multi-actuated and can shoot more than once for maximum ketchup proliferation. See some videos of it in action after the break. 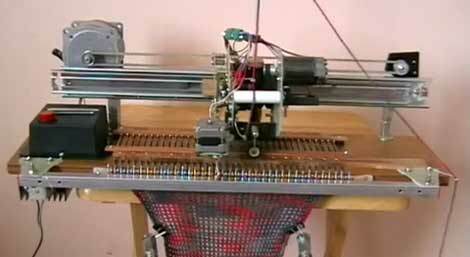 Wow, we knew it wouldn’t be too long before we would see a fully automated home built knitting machine show up. We recently posted a hack where people were emulating the keyboard input of a commercial knitting machine, and that was pretty awesome, but we knew we would be seeing some hacked together machines soon. [corex37] hasn’t let us down with this beast. It is mainly composed of old printer parts, a couple servos, and a Picaxe 18-x microcontroller. It seems to do a good job right now, but lets hope he keeps going. It would be cool to see it able to change colors like the other one. 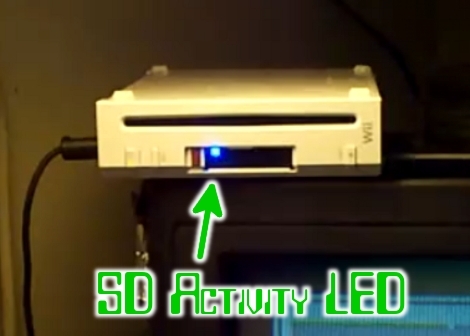 [DeadlyFoez] wanted to know when the SD card in his Nintendo Wii was in use. He built and indicator LED using a PICAXE 08M and added it next to the SD slot. He uses one pin of the microcontroller to monitor the voltage on one pin of the SD card slot. That pin has a specific value when the card is idle, which rises when it’s in use. He didn’t share the details of which pin he’s sampling, or what the magic number from his source code actually represents. But the concept should be enough of a start if you want to do this one yourself. Watch it go blink-ity-blink in the clip after the break.